You may only make _one_ Valentine, but you sure aced it with this one. Love the CAS but sparkling design, Your sponging and blending is just so smooth & perfectly done. Looks smashing with the embossed white heart, and that one gleaming jewel. Love the trio of stripes as a border. TFS & Happy Valentines D.
One card is all you need when it's this pretty! Lovely card and that's a beautiful heart. What a lovely card and the one is the most important! Thank you so much for all your comments on my craftchaos blog. I like the CAS-style on this one and that MD-heart-die is still one of my favorites; a beautiful card! Enjoy the weekend! So pretty in all that glorious red! Thanks for joining the DoubleClick Skittles Challenge. What a wonderful Valentine! Love your sponged ed circle- and your embossed heart. Happy V-day- fun for you to celebrate with us! What a great CAS card design! Thank you for joining in the Creative Moments challenge this fortnight. Beautiful! Thanks for joining the DoubleClick Skittles Challenge!!!!!!! This ua a very nice clean and simple card! A wonderful card Maxine, beautifully done! Such a stunning CAS card! Love the CAS look. Awesome card. Thanks for joining us at Aud Sentiments. A lovely, lovely card Maxine. Your spots of colour highlight the white. What a clean and simple and special card. Maxine your card is very pretty. I love the elegance the CAS look gave it. Happy belated Valentine's to you! This is an awesome CAS design, Maxine! Very elegant...So blessed you joined our bi-weekly Challenge at Word Art Wednesday and hope you join us again for a new Challenge that started yesterday. Leaving you with the inspiration of God's Word in Isaiah 40:8 which tells us, "The grass withers and the flowers fall, but the word of our God endures forever." Great Valentines! Thanks for joining us over at the DoubleClick Skittles Challenge! DT Member Carri~Abusybee Skittles! Fabulous CAS desing, so simple and effective, lovint those stripes. Thank you for joining STAMPlorations February challenge, hope to see you back in March. perfect CAS elegance! 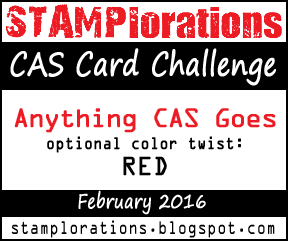 Thank you so much for joining us at STAMPlorations CAS Challenge!